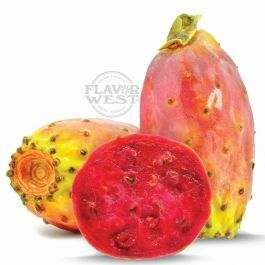 Prickly pear flavor comes from a sweet flesh cactus fruit that offers a taste of its own. The earthy, sweet and subtle taste makes wonders in your treats. Type: Prickly Pear Water Soluble Flavoring. Ingredients: Natural and Artificial Flavoring, Propylene Glycol and Ethanol. USP Kosher Grade Flavoring. Usage Rate: 15-20% for E-use. Flavor Suitability: Suitable for pancakes, desserts, beverages and candy and more. Specific Gravity: 1.13 No Refunds on Flavoring. I love this stuff. I find myself adding a little bit of it to every fruit mixture I make. It provides a full and lush fruit flavor to really balance citrus flavors in addition to cream bases. Buy it, I'd bet you'll have the same experience.